In this Elder Scrolls Online article we’re going to take a look at the Top 5 Tanking Monster Helm Sets. There are many great “tanking” Monster Helms players can use in ESO, but we’ve managed to rank only the best of the best. Read on to find out what they are! PvE – How well does this Set perform in Group Dungeons, Trials and even Maelstrom Arena? PvP – How well does this Set perform in Cyrodiil and Battlegrounds? 1 Piece Bonus – How good is the 1 piece bonus for a tank? Acquisition – How hard is it to get this Monster Helm Set? Note that we’ve given each Set a score for both PvE and PvP, and this is used to calculate the overall ranking of the Set. We take the 1 Piece Bonus into consideration only when the two sets have the same combined PvE + PvP value. Difficulty to acquire is only factored in the event that two Sets have a combined PvE + PvP Score and they share the same 1 Piece Bonus score. Coming in at number 5 is the Thorvokun Set that was added with the Dragon Bones DLC in February of 2018. This Set allows you to place Minor Maim on ALL enemies around you constantly, reducing the damage you take by 15% from each. This Set really shines in Group Dungeons and Trials where you are tanking many enemies at once, and can help to keep you and your teammates alive, since Minor Maim will apply to the damage done to them as well. In PvP the Minor Defile can debuff players by up to 23% reduced Healing Received should you invest heavily into the Befoul Champion Star, and this is quite a significant amount. However, this Set doesn’t have a better PvP rating because it is hard to stay in range of many players, unless you are specifically defending breaches and pins during Sieges, which completely rules out Battlegrounds. When fighting out in the open, it is hard to maintain a good position for maximum impact, and though is still useful while fighting in smaller battles, you will often not reach the full potential of this Set. 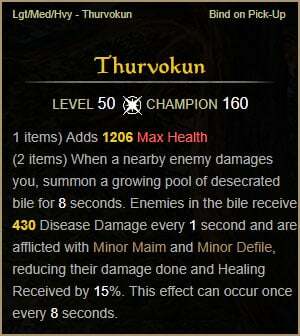 Thorvokun has a decent 1 piece bonus (Maximum Health), that any Tank can make well use of, but it is not very easy to acquire. Fang Lair is one of the most difficult Group Dungeons in the game, and you will need a solid group, and understanding of its mechanics in order to obtain the Helm for this Set. You will also need to own the Dragon Bones DLC or have ESO Plus, which not everyone does. 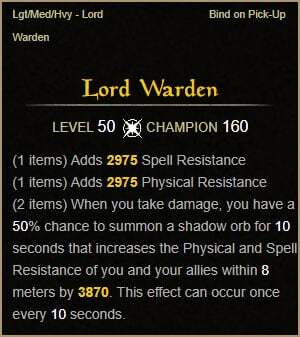 At number 4 is the Lord Warden Set which was added with the Imperial City Update in the fall of 2015. This Set allows you to buff YOU and YOUR TEAMMATES’ Physical and Spell Resistance by 3870 when you take damage. This helps with your own surviveablity, as well as that of your group, which is why it is on the list. Much like Thorvokun, this Set shines in Group Dungeons and Trials where you will be tanking many enemies at once, and where your teammates are likely to catch some AoE damage that you can help mitigate. This Set is slightly better than Thorvokun in PvP because it depends more on the positioning of your group than on the enemy, something that is easier to manage. However, it will also work much better in situations where your teammates are clustered together, which are the same scenarios listed above. In addition, Defile can be cleansed by your enemies, while this buff cannot. The 1 piece bonus on this Set is very very good, and only Monster Helm Sets offer both Physical and Spell Resistance on the same bonus, unlike traditional 5 piece Sets that have them separated into 2 bonuses. This was the deciding factor when ranking it vs. Thorvokun, which only gives Max Health. It is also much easier to acquire, as Imperial City Prison is not as difficult as Fang Lair. The Troll King Set is part of the base game (One Tamriel) and can be found in the Blessed Crucible Group Dungeon. This set increases the Health Recovery of YOURSELF or YOUR TEAMMATES by 1548 whenever you heal them and they are below 50% Health. This Set has no cooldown, so you can affect all players in your group at once, assuming that you have some sort of AoE heal like Vigor or Cleansing Ritual. This Set used to be even better before the Wrathstone changes to Racial Passives, but you can reach an absurd amount of Health Recovery by combining it with the Permafrost Set and the Orginum’s Scales Set, making you very hard to kill. In PvP this Set allows you to tank large groups of players, assuming you are geared properly. Because your Health Recovery still applies when you are CCed, it renders them much less useful to other players, making them waste time on you while your group wipes them out. Both Health Potions and the Healthy Champion Star increase Health Recovery by a %, so be sure to use these when making such a setup. This Set has a poor 1 piece bonus in Healing Done, but is considerably easier to obtain than Thorvokun and Lord Warden, making it slip ahead of both of them by a small margin. If getting a solid group together to run Dungeons is not an issue for you, I’d go for one of the above two Sets instead (unless you are specifically going for a Health Recovery Build). At number 2 we have the brand new Symphony of Blades Set that just launched with the Wrathstone DLC yesterday. This Set gives another player in your group the equivalent of 1550 Magicka or Stamina Recovery over 18 seconds, whenever you heal them when they are under 50% of their primary resource. They gain these resources over 6 seconds though, and then the Set is on cooldown for another 12, making the resource return rather rapid. This helps alleviate resource management in your group, increasing DPS, and making your job easier because things that are dead don’t need tanking. This Set will be abused for sure by Stamina DPS, and Templar groups in Battlegrounds. Imagine 4 Stamina DPS running Vigor that make each other all recover resources naturally without having to change their Build one bit…It will have much more limited use out in Cyrodiil because unless everyone in the group is wearing it, you will likely not notice the change. In addition, that amount of resource gain won’t do much to save you against a zerg army. The 1 piece bonus of this Set increases your Healing Done, which isn’t particularly useful to most tanks. And even though some may enjoy it, there are better bonuses out there to be sure. 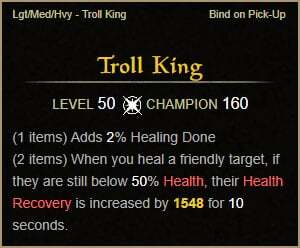 It beats out Troll King for the second spot, because resources are more important than healing in many cases. Taking the number 1 spot we have another brand new Set in Stonekeeper, which just became available with the Wrathstone DLC yesterday as well. This Set gives the player a large amount of Stamina, Magicka, and a bit of Health for simply Blocking consistently. Since this is something tanks do anyway, it makes it a perfect Set for this role. 5350 Stamina and Magicka every 14 seconds translates to roughly 764 Magicka and Stamina Recovery, which is a staggering amount. This should allow just about any tank to self sustain through any fight, and makes Blocking for extended periods a non-issue. In PvP this will allow players to create “perma-block” Builds, while topping off their Magicka which they can use to heal or cast a Damage Shield, making them nearly indestructible. If you’re looking for that Monster Helm Set that will keep you alive longer than any other, this is the one for you. 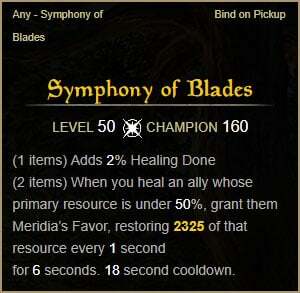 Resource management is key in PvP, and although this one provides less than Symphony of Blades, it actually provides them to YOU. The 1 piece bonus is second only to Domihaus for the best 1 piece bonus in the game. 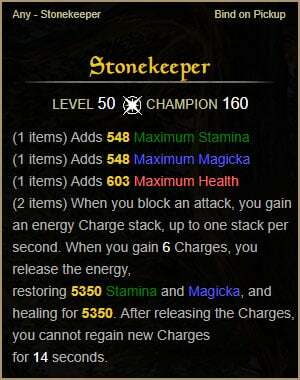 Adding 548 Stamina/Magicka and 603 Max Health is a huge amount of stats for one piece of gear, and that is before the Enchantment on the piece of Armor. The only downside is that the Set is hard to get, and requires the new Wrathstone DLC, which you may or may not have. Stay tuned as we cover more of Elder Scrolls Online’s many Sets and take a look at which are the best for each role and game type!